The Green Girl is an RRCA Certified Running Coach! In this country, there are two major running coach programs that are respected in the running community as qualified sources for running. The USATF (USA Track and Field) Certified Coach program focuses on youth to adult track runners. Though qualified to train track runners as well, the RRCA (Road Runner's Club of America) Coach Certification is more concentrated on training plans for athletes ranging from a 5k and beyond. 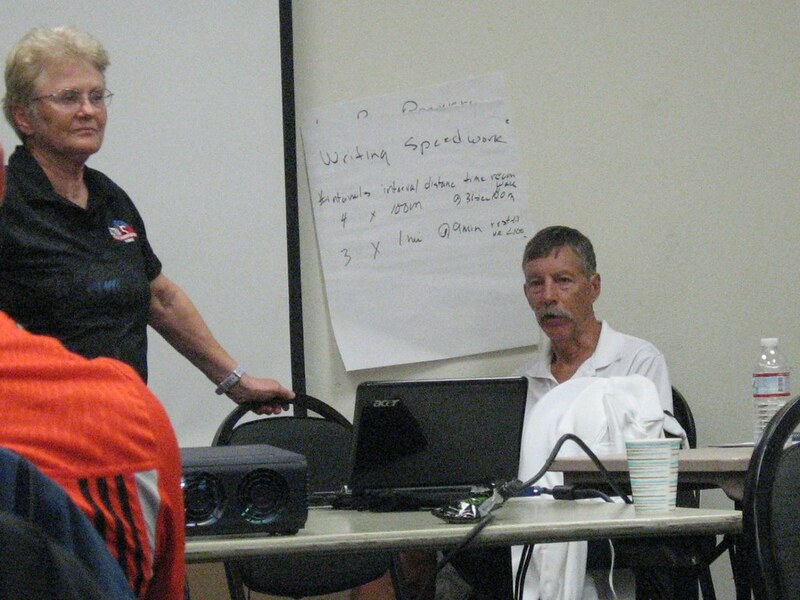 The course was taught by RRCA Coaches, Patti and Warren Finke. Both Patti and Warren have completed over 170 marathon distance or longer events. In addition to teaching coaching certification seminars, they are the founders and directors of the Portland Marathon Training Clinic. Patti is also an exercise physiologist. Patti and Warren are also the authors of the text used for the course, Marathoning, Start To Finish. The course started off with the physiological effects of exercise followed by the the phases of marathon training. Topics such as basebuilding, sharpening, tapering, race preparation, carbohydrate loading, recovery, and supplemental training were covered. The material was comprehensive and highly efficacious. Patti and Warren brought forth years of experience - including trial and error - through their teaching and storytelling. I walked away from this course a more well-informed, enlightened, and RRCA Certified Green Girl. YAY!!! Welcome to the club! The Green Coach. Has a ring to it. G.G.,why do you want to go to Dubai? I have no desire at all. Looks like Vegas to me. If you have time, can you email me and let me know. I have a weekend there and have no plans. There are "contact me" buttons on my Blog. Only if you have time. AWESOME!! That is so exciting! congrats! Welcome to the club! I really enjoyed my training. Congratulations!! Starting to sound like you're not so Green anymore, as in newbie-green. Well done! You always amaze me with the tings you do and achieve. Keep it going! YAY!!! Will look forward to picking your brain!! Coach Greenie?!! So so AWESOME! I hope to become one aswell! aha, now the Green girls coaching, running. Congratulations! I love your motivation. Awesome! You're the right person for the job! i would soooo love to be a coach, I jsut think it's the greatest thing. congrats to you for putting in the work!! Nice job Green Girl! It's great to see people who care about something and go get some quality education on the subject! I checked out the RRCA website. The organization has been around for a long time and looks like they have a great certification. Thanks for telling us your accomplishment!